Elected, selected, same difference, right? My initial idea with this goal was to step out of my comfort zone and find a new area where I could show some leadership about something. And I certainly did that. Why? Starting October 26, 2015, I’ll be in a new job at Mount Holyoke College as the Director of Research & Instructional Support. I’ve been at Wellesley College for almost ten years now and have had a lot of different roles there in that time. I wasn’t looking for a new job, but this position was right up my alley. So I applied, interviewed, and was offered the position. That sure counts as trying to get “elected” to something in my book! Turns out, making fresh lemonade is super easy if you have an easy way to squeeze the lemons. 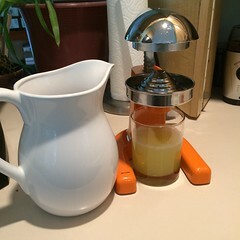 I do, in the form of an orange juice press that Amy and I got for our wedding 9 years ago. 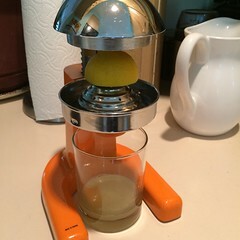 We use it regularly in the winter when oranges are in season, and today I pulled it out to see how it works with lemons. Answer: great! I used this recipe from Real Simple. Photos of making syrup are boring, so you only get lemon photos. Eight lemons later, I had a cup of juice. 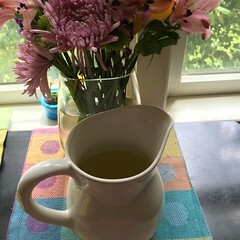 Juice mixed with cooled syrup and cold water, hard to tell it’s lemonade because the pitcher is white. Oh well. 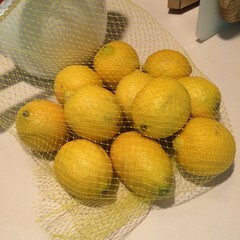 Now I just need to wait for the lemonade to get really cold in the fridge and then to drink it. I think that’ll be tomorrow, when it’s supposed to be sunnier and warmer than today, and when I’ll mow the lawn. Related: what is UP, June? I think you’re drunk and need to go home. These temperatures are ridiculous. Today was Thanksgiving. I am so blessed to have spent the day with those I love the most: my wife, my parents, my in-laws, my grandma, and one of my awesome aunts.